Based on the same design as the 30GH/s Little Single the 60GH/s unit boasted 2x main ASIC chips inside with 2 Large CPU style heat sinks to cool them. This unit was even louder than the 30GH/s as it has an extra 80mm fan and more heat sink to drag the air over. With 2x 120mm Fans mounted at either end of a tube making a wind tunnel and 2x CPU style heat sinks inside with a further 80mm fans pointing down this must have been the worst ait flow design I had ever seen. why did then not make the internal heat sink the same as an off-the-shelf heat sink with cross flow design? Quieter, cooler and probably less expensive! Best option for these units was to completely remove the 2x end grills and replace the fans with Noctua’s. Going 1 stage further, ditch the tube design and run the just 2x 80mm Fans pointing down to cool the units. This proved to keep them cool even in the summer and keep the noise and quiet as possible. This way you just need to store them out of harms way on the top of a cupboard or high shelf. The PSU supplied by BFL was also hideously noisy, unreliable and inefficient. 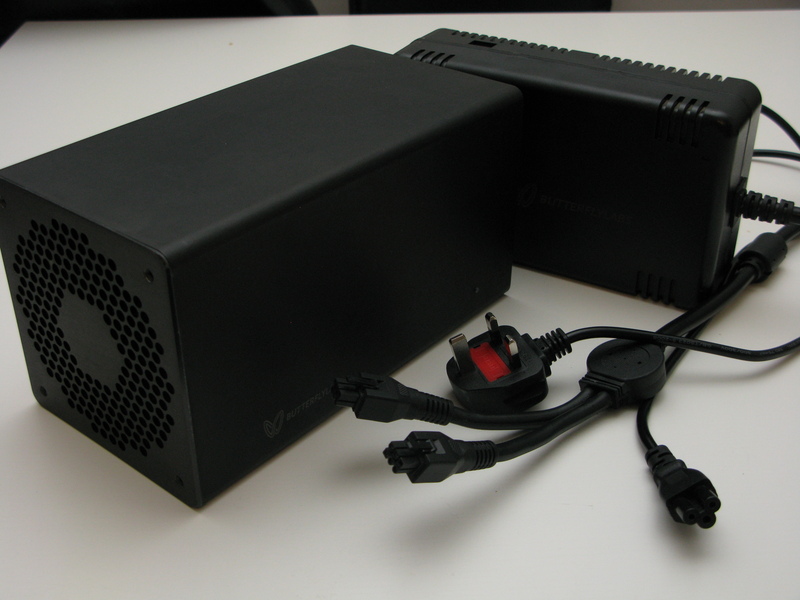 Best use a standard PC PSU with a 80+ Gold rating. Some of them even caught fire!